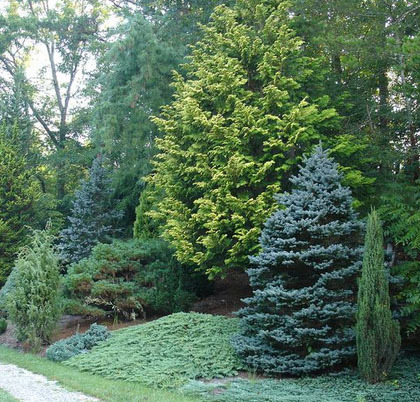 Evergreens bring beauty and energy to any landscape. These durable trees are easy to love and relatively easy to care for. However, they do require come special maintenance to thrive long term. Taking care of ornamental evergreen trees is a wonderful skill to have. Yes, you can always call a landscaper, but don�t let pruning intimidate you. Once you learn the basics you�ll understand how to properly prune, when do to it and why it must be done. Your evergreens will need to be looked at and pruned every year. Before reaching for the tools, examine them for areas that look overgrown or weak. This will help you assess how much pruning will be necessary � whether you�ll need to revive the trees� health or simply maintain bounds and allow them to grow. Pruning tools must be cared for. Keep them sharp and lubricated to prevent rust. Invest in the best quality you can afford. Hand shears are useful for getting a close cut when the evergreens are young. Pole pruners extend your reach, but should never be used near utility lines. Pruning saws have wider teeth than standard saws to prevent tree sap from gumming between the blade. You probably already know pruning is essential for trees and hedges. Specifically it allows you to control plant size so it doesn�t overcrowd other trees and growth. Eliminating dead and weak branches promotes survival of stronger branches and new growth. If you live in a windy area, thinning the crown allows wind to get through the tree. This reduces the risk of either branches falling or the whole thing coming down. This also prevents property damage and interference with power lines. Removing brown needles and branches improves the appearance and makes you whole yard look better cared for. Cutting off dead and diseased braches also eliminates the chance of sickness spreading through the whole tree. Taking care of ornamental evergreen trees successfully means knowing the best time to do it. Most evergreens can be cared for any time of year as long as the wood isn�t frozen, but ideally maintenance is timed around the growing habits of the tree. As trimming stimulates new growth, it�s best to do so when the weather is conducive for new growth to thrive. Late spring is the perfect time to prune evergreens. This catches them just as new branches elongate but before they stiffen. There are a few different methods, depending on the needs of the tree. With evergreen shrubs and trees, thinning is often the best way. You can thicken new growth on pines, spruce, firs and other coniferous varieties by pinching about 2 inches of new growth in spring. Don�t use shears for this as the needles around the edge of the cut will brown. While some believe dressing a wound with tree paint is good for the tree, horticulturalists disagree. This may actually harbor disease and slow healing. When appearance is a factor, use latex paint. If the evergreen�s health is your only consideration, don�t dress or paint a cut. Always survey the area and be aware of power lines. Call the power company if an electric line is touching your tree. Call in a professional if the size of the tree is too big for you. Keep your fingers clear from the clippers and away from your eyes until washing them. Taking care of ornamental evergreen trees will have your yard looking lovelier than ever.